I am a firm believer of eating EVERYTHING! I do not discriminate on any type of food, I especially love all dairy (really, cheese is my love child) and bread and fruit and veggies and all meat. Food is what truly makes the world go round. That being said, I do know that there are folks with serious allergies and illnesses when it comes to certain foods. My daughter has an egg allergy (saddest thing ever) so baked goods are sometimes difficult for her to eat. I have several recipes WITH eggs that are mild enough and don’t affect her. But when it comes to cookies, she has a super tough time. Those soft, gooey centers don’t lend themselves well to someone with an egg allergy. 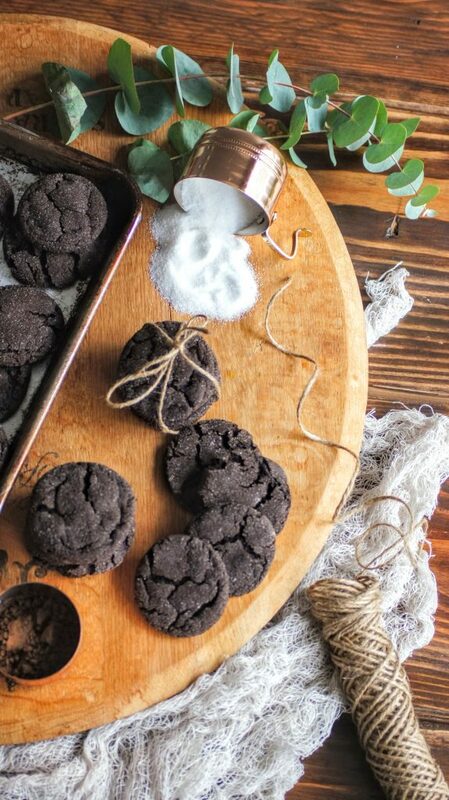 I sought out to make the perfect chocolate cookie for her a while back which won over her heart and belly. Most recently, I added peanut butter (which makes them 100x better) and adjusted some other pieces to make them fully vegan for some of my other sweet friends. A close friend of mine is vegan and also a fabulous baker. One day I tried some cookies she made, I was astounded at how wonderful they tasted. I had considered vegan baked goods an oxymoron, but my opinion quickly changed after that day. I also realized that just because they are vegan doesn’t mean they are healthy, hahaha! These guys have flour + sugar and all the goodies that make cookies perfect treats. 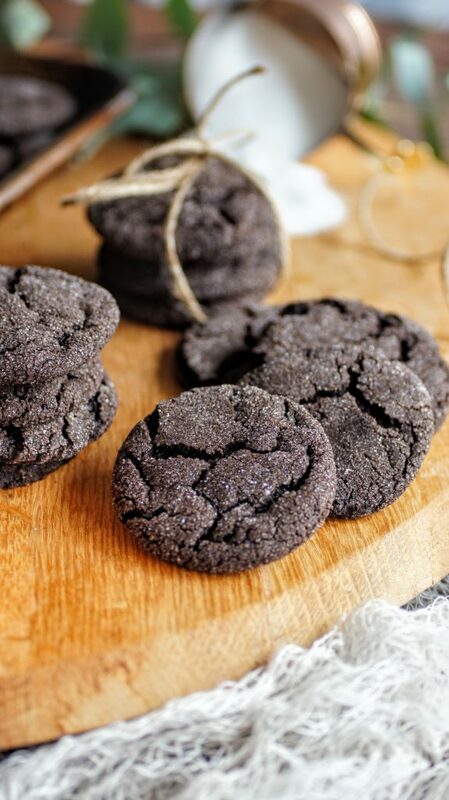 I think these cookies are an exquisite texture: soft, chewy, dark, the perfect bite. I can totally see smooshing some ice cream in between two cookies and having the most amazing ice cream sandwich. I personally love using a very deep dark cocoa powder, I use Hershey’s Special Dark, it has a mix of both Dutch and Natural Cocoas and really gives a nice depth of flavor. 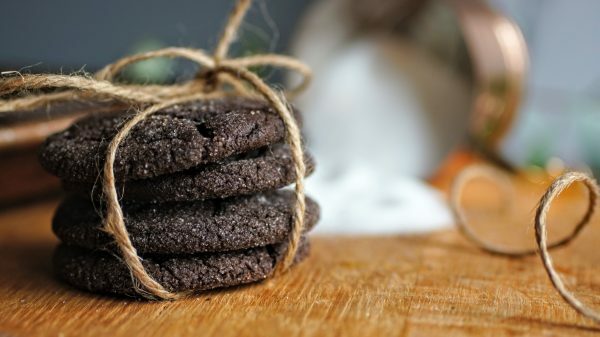 These cookies are so versatile, while they are written as vegan, you can adjust and adapt them to your liking, subbing the vegan butter/margarine for standard butter and the water for any type of milk (cow, almond, rice, hemp). And of course, sub out the peanut butter for almond butter or another butter of your choice. It is super flexible and packs a ton of flavor, perfect for kids and adults alike. Not to mention, these would be an AMAZING cookie to share at a holiday cookie exchange. I hope you give them a try and as always, I love seeing your creations, tag me on Instagram @CosettesKitchen or post on my Facebook Page. Preheat oven to 400 degrees and line two sheet pan with parchment paper or silicone liners. Using your stand or hand mixer, cream together sugar, margarine and coconut oil. Add in your peanut butter and vanilla, continue to cream. In a small bowl, mix together your dry ingredients and whisk until combined. Slowly add in with your mixer on low speed until combined. Finally add in your water, add additional if dough seems too dry. The dough should be firm and hold together. Using a cookie scoop, scoop out dough and roll into a smooth ball. Roll into granulated sugar and place on prepared baking sheet. Continue until cookie dough is done. Bake cookies for 12-15 minutes (swap trays at halfway point) until they begin to crackle. Remove, let cool on tray then transfer to cooling rack. Enjoy. Cookies keep well in a sealed container for a week.